Under the general direction of the Director of Procurement Services and the immediate supervision of the Associate Director of Capital Projects and Contract Administration (CPCA), and/or his/her designee, this position will support the University’ s capital program (which includes the Next Generation/UCONN 2000) by prequalifying design professional services and construction contractors, soliciting competitive bids, and negotiating in an open, fair, and competitive manner. Primary responsibilities of a Purchasing Agent II include, but are not limited to, utilize existing policies, procedures, and statutes to plan, develop and organize all phases of assigned responsibilities for prequalification, bidding, awarding, contracting, and contract administration functions of construction and design professional services related procurement; receive, process, and approve requisitions and purchase orders for goods and services; determine most appropriate delivery method of procurement of goods and services in accordance with federal/state statutes and University policies and procedures; prepare and solicit competitive bids from qualified vendors; define and negotiate appropriate terms and conditions on behalf of the University relative to contractual obligations; recommend and/or authorize the purchase of goods and services and ensures the unique needs of the University are being addressed with needs analysis, scheduling, knowledge of local/regional construction industry and market as well as industry trends. Receive requests for goods and services from departments and determine most appropriate method of procurement in accordance with federal and state statutes as well as University policies and procedures. Develop RFQ’ s, RFP’ s, bid documents, recommends awards, solicits competitive bids from qualified design professionals, consultants, general contractors, trade contractors, construction managers, and vendors, assist with contract preparation, and ensure compliance to department and University policies and procedures. Review and authorize purchase orders and change orders within delegated authorized dollar limits for construction services and materials from qualified vendors, contractors, design professionals, consultants, etc. and ensure services are procured in accordance with contract documents, C.G.S. and University requirements. Manage the prequalification and selection process for contractors, design professionals and consultants to ensure compliance with regulatory sources and university policy and procedures. Develop and maintain proper records documenting the selection of contractors. Work to identify new and innovative methods and processes to accomplish the design professional and construction procurement tasks while ensuring compliance to statutes and University policies. In cooperation and coordination with the University’ s Planning, Design & Construction Department (UPDC) and UConn Health, Campus Planning, Design & Construction (CPDC), create the appropriate prequalification and procurement documents, general and special conditions, safety requirements and scope of the design and construction project procurement requirements. As authorized by the Associate Director, conduct negotiations on contract prices, technical requirements, and terms and conditions; issue recommendations for contract and service awards to the Project Engineer/Project Architect/Project Manager. Assist with contract administration functions, monitoring design professional and contractor performance ensuring compliance with contract terms including change orders, contractor delay, appeals, claims liquidated damages, settlements and terminations. Maintain records on contract administration actions and requirements. Evaluate contractor compliance with contract clauses and initiates corrective actions when problems are identified. Respond to inquiries and requests relating to capital program procurement activities; assist with contractor payment inquiries; and participate in post project completion issues and related issues, as applicable. May train, instruct and supervise a team comprised of a Purchasing Agent I and/or a Purchasing Assistant(s). Develop and maintains purchasing expertise in business and procurement law, federal and state statutes, the Uniform Commercial Code, environmental and safety issues, and state and University policies and procedures. Conduct training seminars for faculty and staff pertaining to purchasing policies and procedures within assigned area(s) of expertise. Collaborate with University stakeholders to support an effective Supplier Diversity Program. Prepares reports, presentations, and other documents. Bachelor' s degree, preferably in design and/or a construction related discipline, and four (4) years professional experience in a comparable institutional environment OR an equivalent combination of education and related professional experience which totals a minimum of eight (8) years. Excellent interpersonal skills and the ability to communicate clearly both verbally and in writing. Demonstrated decision making skills and the ability to facilitate decisions that set priorities, resolve conflict, and drive results. Thorough working technical knowledge and understanding of design professional services and construction methods. Knowledge of contract law, accounting, finance, and marketing as they relate to purchasing and procurement delivery methods, strategies and trends in local, regional and national construction industries, and federal and state statutes. Ability to assess organizational needs, communicate those needs to the contractor/vendor community, evaluate services and products to determine technical compliance and resolve discrepancies. Ability to analyze data, business and market trends and recommend solutions. Experience working with contractors, design professionals, engineers, consultants, and staff to manage expectations, and identify and remove barriers that are impeding progress and/or performance. Knowledge and proficiency in contractor and design professional services proposal analysis, commodity forecasting, quality assessment and value analysis. Demonstrated integrity and ability to act without consideration of personal gain and take prompt action in the case of unprofessional and unethical behavior. Demonstrated ability and supervisory skills to train less experienced procurement staff. Strong background in construction procurement and knowledge of contracting, construction scheduling, and construction methods, as well as design professional services procurement and contracting. Strong computer experience in MSWord, Excel, Access, PowerPoint, Project and Outlook. Demonstrated ability to develop and maintain constructive, professional relationships with a wide variety of individuals. Advanced degree, preferably in design and/or a construction related discipline. Familiarity with following software applications: SciQuest (eProcurement Solution), KFS (Kuali Financial Systems), Oracle Unifier, AssetWorks and/or other commercial planning and project management software. Knowledge of State of CT General Statutes, Federal Regulations, and University Procurement Policies and Procedures as they relate to construction procurement. Colin Paterson has over 6 years of experience in the staffing industry and leads our Office Support team here at J. Morrissey. He primarily focuses on temporary placements of office and financial professional across all industries. Prior to joining J. Morrissey, Colin was a Contracts and Recruiting Manager at a national recruiting and staffing firm where he led a team of recruiters focusing on sourcing and filling skilled positions across manufacturing, engineering and distribution industries. While there he learned various management styles, industry trends, sales techniques and situational leadership skills. 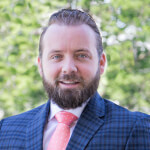 Colin is actively involved with Quinnipiac Valley Chamber of Commerce, Bristol Continuing Education, and the Central Connecticut State University Alumni Association. He received his Bachelor’s degree in Business Administration from Central Connecticut State University. His recruiting and staffing industry knowledge enables him to communicate effectively with his candidates and clients to ensure good matches on both sides.